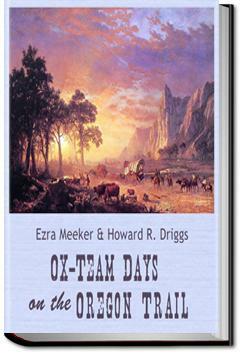 Ezra Meeker…was an early pioneer who traveled the Oregon Trail by ox cart as a young man. Beginning in his 70s, he worked tirelessly to memorialize the trail, repeatedly retracing the trip of his youth. This book is a memoir of those days. . . .Some of the young men, keen for hunting, had made themselves sick by getting overheated and drinking impure water. Such was the experience of my brother Oliver. Being of an adventurous spirit, he could not restrain his ardor, gave chase to the buffaloes, and fell sick almost to death. This occurred just at the time when we encountered the cholera panic. It must be the cholera that had taken hold of him, his companions argued. Some of his party could not delay. "It is certain death," I said, "to take him along in that condition." They admitted this to be true. "Divide the outfit, then," it was suggested. Two of Oliver's companions, the Davenport brothers, would not leave him; so their portion of the outfit was set aside with his. This gave the three a wagon and a team. Turning to Buck, I said, "I can't ask you to stay with me." Nice, clear writing about the author's adventures taking his family from Indiana to Iowa to Washington State (that didn't exist yet) in the 1850's. A fine historical account that brought to life a time in in our recent past. loved it thank you for the hard work to make it available o the public. Fascinating account of a great journey. Great story, fascinating character in the history of the west. New respect for oxen and the men who handled them. Although this book is interesting, the real events must have been much more so. It is really a series of anecdotes that bring out some of the highlights, but there is not enough detail to get a feel for how difficult this trip must have been.